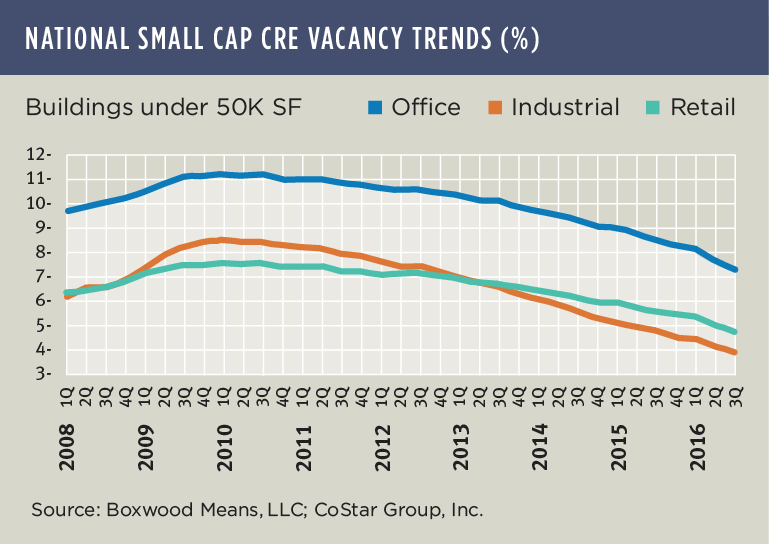 Small cap CRE space market results for third quarter dispelled any rumors about the bull market's demise, as the latest wave of tenant demand propelled vacancies into unprecedented, low territory. With little friction from added supply, vacancy rates slipped to new depths. The national office vacancy rate dropped 40 basis points (bps) in the quarter and 120 bps YOY to 7.3% according to CoStar data. At this level, average office vacancies are 100 bps lower than the rock-bottom rate attained during 2006. Similarly, vacancy rates for small shopping centers and general retail stores narrowed by 30 bps in the quarter and 90 bps YOY to 4.7%. Retail's national average vacancy rate is now 120 bps beneath the pre-recession nadir. The vacancy rate for small warehouse, flex and light industrial properties dipped 20 bps and, at a national average of 3.8%, has penetrated way below the previous floor of 6.1% reached a decade ago. See the nearby vacancy trends graph. A restrained construction pipeline augurs stable and tight space market conditions going forward. 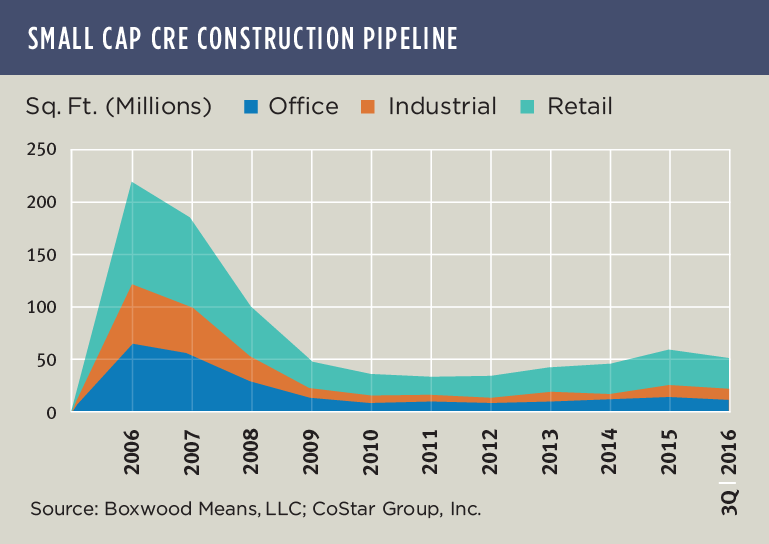 As shown in the nearby graph, aggregate projects under construction (UC) totaling 53.1 million sq. ft. are just a fraction of the previous peak amount. That is, while the pipeline today has expanded nearly 50% since the 2011 trough, UC projects are still only 25% of the total in 2006. The lag in new projects can be partially explained by agency regulations that impose higher capital reserves on bank construction loans qualifying under the high volatility commercial real estate (HVCRE) rule. So, too, the U.S. economy's uneven and moderate growth trend plays a role. Finally, we suggest that a lack of transparency generally for the small cap CRE market and, more specifically, inadequate distinction between market trends in the smaller and larger CRE domains-also has a diminishing effect on small balance lending for new construction projects (and even some stabilized properties). But the bottom line is there's ample momentum behind the bull market as we approach year end.